The musical. A time honored tradition of Hollywood that’s seen it’s ups and downs over the years. The glory days of Hollywood saw many a musical spectacle before things went a little south since then, none really capturing the magic of the classic Hollywood musical. 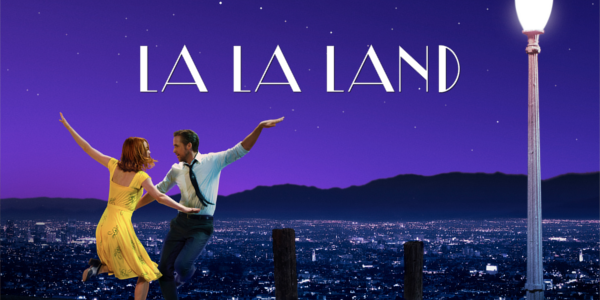 La La Land does something spectacular here to get back to the glory days of musicals, putting just as much focus on energy and movement within the music, making even the simplest note mean so much more. In the heart of Los Angeles, aspiring actress Mia (Emma Stone) serves lattes to movie stars in between auditions while dedicated jazz musician Sebastian (Ryan Gosling) plays in dingy bars in order to scrape by. The two meet and fall in love, but, as success mounts, the dreams they worked so hard to maintain threaten to tear them apart. La La Land is at its core about dreams and love and the balance between them. It follows these two individuals that share the same sentiments and ideals just in different dreams. And the ability that the filmmakers and crew here show to capture this magical and insightful look at dreamers. These two characters, so passionate about their respective careers, fall in love in a manner that only a musical could show. Their fluid and in sync movements and vocals match their increasing growing romance and it’s wonderful to watch. The two leads, both getting quite the awards buzz, really make the film work even more than it would’ve before. Emma Stone and Ryan Gosling, by all definitions, are movie stars and their chemistry and ability to play off of one another makes every minute a joy to take in. Gosling is smooth and charismatic, everything you’d expect from a jazz purist while Stone is clever and devoted, determined to make it one way or the other. Their depth as characters would work in a film where the music wasn’t in play and their inherent understanding of what these characters are makes La La Land all the better. Damien Chazelle is truly a special director. Not only did he direct Whiplash, one of the best films of 2014, he has managed to create something that few movies have captured despite many attempts. It’s that allure of Hollywood brought into a modern day setting that pays homage to so many classics without ever mimicking or copying them. The visuals presented in line with the magnificent musical numbers add up for a treat for the eyes and ears like nothing else you’ll see in 2016. Overall, La La Land is among the best of the best in 2016. The film is movie magic at it’s finest and almost creates this sense of magic within the real world because of it. Ryan Gosling and Emma Stone are at the top of their games, with Stone perhaps the best she has ever been and the music is spectacular from start to finish. The film about dreams feels really relevant to 2016, a year that has seen so many pitfalls, showing that dreaming is not only inevitable, but necessary. So are you looking forward to La La Land and what's your favorite musical of all time? Subscribe, share, comment below, and as always return to I Am Sam for weekly reviews and insight.